Help Erik become an adventurer. Talk to Erik in Rorikstead. Convince Mralki to allow Erik to become an adventurer. 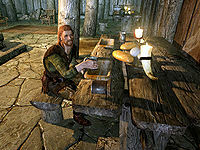 Erik can be found staying in the Frostfruit Inn in the evening or working as a farmer for Lemkil in the small settlement of Rorikstead. He will be glad to see you, another adventurer: "You look like you've seen your share of adventure. I envy you that." In fact, he wants to be an adventurer like you, but his father Mralki doesn't agree. Not only does the farm need him, but his family couldn't afford to buy armor even if he did let Erik pursue his dream. Erik hopes you can talk to his father and change his mind. You should let your son choose the life he wants. But the world is a dangerous place. Erik has no idea what he's getting himself into. What's more, he's got no armor. I'll have to save up the money for it. Your days of exploiting your son are over. Exploiting? What's that supposed to mean? Erik works the farm because he's a good lad! I'm not forcing him to stay here. I know that he wants a life of adventure, but I've told him before that I can't afford to buy him armor. Then you can attempt to persuade or intimidate Mralki. You must pass an easy Speech check to persuade him. You can also give him some gold for the cost of armor. Here, use this to buy some armor. (Bribe) Passed: You would give your own coin to help my son? I'm moved by your compassion. Your kind deed will not go unrewarded, my friend. Tell Erik I've changed my mind, and we'll visit Whiterun soon to fit him for armor. You'd prefer your son to grow bitter and resent you? (Persuade) Passed: I... I cannot deny the truth of what you say. Erik is all the family that I have left, but it's wrong to hold him back as I have. Go and tell Erik that I've changed my mind. I'll see about borrowing some money in Whiterun for his armor. Find the money, or you'll have me to deal with. (Intimidate) Passed: Ah, I see. I've just remembered that I saved a few septims in case of an emergency. This is starting to feel like one. Tell Erik that I've changed my mind, and we'll visit Whiterun soon to fit him for armor. And please don't hurt me! Bring the good news to Erik and he will be very excited. "I'll hope you'll come back to Rorikstead soon and pay me a visit. Maybe we can swap stories about our adventures over a mug of ale at the inn!" The next time you see him, he will be equipped with a set of iron armor and you can also ask him to be your follower. If you complete the quest, then rent a room and stay at the inn overnight, Erik the Slayer may be enabled while you are in bed, and will be frozen and impossible to interact with when you get up. ? The following empty quest stages were omitted from the table: 0, 5, 200. On the PC, it is possible to use the console to advance through the quest by entering setstage RoriksteadFreeform stage, where stage is the number of the stage you wish to complete. It is not possible to un-complete (i.e. go back) quest stages, but it is possible to clear all stages of the quest using resetquest RoriksteadFreeform.